The theme of the fourth edition of Is My Blog Burning is Around the world in a bowl of rice, hosted by Chez Pim. I was going to do something sushi-esque, but I'm leaving in a couple of hours for a weeklong business trip and didn't have time to do the shopping needed for what I had in mind. So, I decided to do something with the ingredients I had already....which lead to that good old standby, fried rice. Fried rice, aka cha-han, is another Chinese dish that has been adopted and adapted into everyday Japanese cooking. It can be elaborate, or a convenient way to use up leftover meat and vegetables, or both. The basics are rice - either freshly cooked or cold; some sort of aromatic vegetable, usually spring onions and/or fresh ginger; and eggs. I was out of spring onions and the shops were closed already, so I hit upon the idea of using the chives that are growing right now in the wilderness that is the garden in front of the house. (Thank goodness we have no lawn patrol here.) I used both the leaves and the pretty purple blossoms. The results were really quite good - mildly onion-y and garlicky, and tasting quite spring-like. 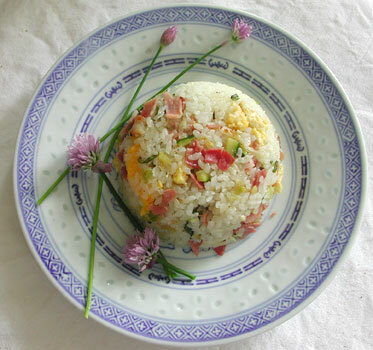 Using chive blossoms as garnish enhances the flavor as well as making plain old fried rice look very pretty. 2 cups of cooked rice. I use regular Japonica rice, but you can use any kind of rice you like. The key to making fried rice is to have a pan that can get very hot, so an iron wok on gas heat is ideal. Unfortunately, here in Switzerland gas cooking are practically unheard of, and I just have an electric range. I do however have a halogen quick-heat hob, which helps. I can't use a normal rounded-bottom wok however, so I make do with a flat bottomed one. The results may not be as good as if I cooked in a proper hot iron wok, but it is not bad. Heat the oil in the wok or pan. Add the ginger and fry until just turning a bit brown. Add the ham and the zucchini; sauté until the ham is turning a bit crispy. In a separate pan, cook the eggs, mixing around vigorously to make little bits. Add the rice to the pan and sauté, tossing and turning it to separate the grains and coat each grain with the oil. Add the chives and keep tossing. Add the eggs, and if you are using it a sprinkle of the soup stock granules. Clear a space on the bottom of the wok and drop in about a tablespoonful of soy sauce (adding to the hot pan surface makes the soy sauce take on a nice toasty flavor). Toss well; add salt and pepper to taste. To serve, press the rice into a bowl, and turn it out onto a dish. Garnish with chive blossoms. Submitted by maki on 2004-05-23 06:39. This dish looks delicious -- I assume it would make a great side dish, but looks wonderful on its own. And let me tell you -- I am so going to pick all the chive blossoms at my mom's this afternoon...the perfect garnish and addtion! Thanks, Maki! We have have chive growing wild in our side yard, and it seems when they are in season, we eat dishes with so much chive, they may as well be the main ingredient - like "chive omelette" (really scrambled egg, more than omelette) with so much chive, it's like chives with just enough egg to bind the thing together. I've watched my mother do it many times over the years, but I'm going to have to ask her to decribe how she does the eggs in fried rice so that she doesn't have to fry them separately or deliberately make it go to pieces. I think she swirls it thin and lets it set to just the right degree before tossing the rice in and the frying with the rice naturally makes the egg go into pieces. The dish looks fantastic. I use similar ingredients but mine never looks as pretty. I never thought of using the chive tops as decoration but the idea is great, thanks! BTW what's a lawn patrol? This looks so yummy! I must try to make fried rice using chives next time. I think the flavor will be a bit milder than what you normally get with green onions. very pretty plate of fried rice! love the colors! For the eggs - when I could cook on a gas range and have the really high heat I'd cook it in the same pan too, but with electric heat and a flatbottomed "wok" (which really isn't) I find that the egg somehow sticks...so I just cook it in a separate pan. Since this post, I have been keeping a hawk-eye out for chives growing along the road. I hope I'll find them with the pretty flowers too! The rice sounds fantastic but I have to tell you, the presentation is gorgeous! too bad you don't use gas cooking and the round bottom chinese wok there. i don't like electrical stoves. food tend to taste bland and less aromatic with electric cooking. This is gorgeous. Simple, but looks delicious. Thanks so much for participating. Pim, thank you very much for hosting it! I'm enoying reading all the entries again.